Archeologists and historians proved that horses were handled on the territory of Turkmenistan minimum five thousand years ago. The specialist do not hesitate that foothill lands of Kopetdag made favorable ecological conditions for the birth of strapping and wanton horses. They are protected from cold winds of the valleys which abound in leguminous and cereals, lush grass of mountain meadows in summer and the abundance of ponds. That is why it is unusual for the akhaltekins to use to fodder of low quality and they hardly stand frost. At that ancient time a man settled in that area, and this explains the early domestication of horses. One should note that, in the foothills of Kopetdag in the past there was a great deal of big predators (tiger, snow leopard), and the rugged relief created for them convenient shelters for ambushes. The horse had to be on guard, and when the danger was it jumped aside, galloped at full speed through the hills, quickly changed direction not to fall into the precipice. This disturbing life flowing in favorable feeding conditions, stimulated the evolution of the Akhaltekins ancestors in the direction of the exclusive breakneck speed, acute senses, easy excitability, and therefore a high degree of development of the nervous system. These valuable qualities of the breed were developed by the ancestors of the Turkmen. Not only highly feeding (for example, lucerne), but also grain played a big role. It was possible only thanks to the development of agriculture in these areas. In Turkmenistan people had a very strict attitude towards clearness of the origin of the horse in ancient times. Whatever the scientists were arguing about where the first horse was domesticated, the most ancient image of the domestic horse was found on the territory of our country (the image is on the fragment of the ceramic vessel from the Kara-depe IV thousand years BC). The statuettes of horses founded in the settlement of Altyn-depe and Ulug-depe date from the III millennium BC. The bones of horses were found in Anau. But skeptics, until a recent date, rejected the Turkmen origin of the horse. New and truly sensational discoveries were made in 2000 by archaeologists on the site of ancient settlement Gonur - depe (Margush). They found the skeleton of a foal, but it is a fact that points that it was already a pet that was born here but did not get to these places from the outside. In 2001 a unique bronze horse's head (length 7 cm., weight - 1 kg (! )), and small musical trumpets (4 pieces.) were found. These trumpets were used exclusively for training horses which learned to move on command under the sounds. There is no more doubt that the Turkmen are not only the oldest farmers, carpet manufacturers in the world, and also horse breeders. Turkmenistan was and remains not only an international center of Akhaltekin horse breeding, but also motherland of breeding. The ancestors of the Turkmen surrounded their horses by the utmost care. The horse was always a sacred animal for them. It is hard to imagine the Turkman without the horse, because by the figurative expression of European authors, the horse is an equal member of the Turkmen family. Careful and reverent attitude to the horse, the Turkmen carried through the millennium. It should be noted that the ancient historians were well informed about motherland of extraordinary Argamaks. For 200 years before the establishment of the Parthian empire the Greek historian Herodotus (V century BC.) wrote "Here are the reasons why Nisay horses are called such a way: there is a vast plain called Nisayya. The magnificent horses are on this plain". The ancient Romans also paid attention to the Parthian horses, because the Parthian cavalry smashed famous Roman legions. Appian, in his "History of Ancient Rome", wrote: " Nisei horses outbrave all. These horses are worth of mighty kings, beautiful in appearance, easily playing under the rider, readily obeying to the bit ... 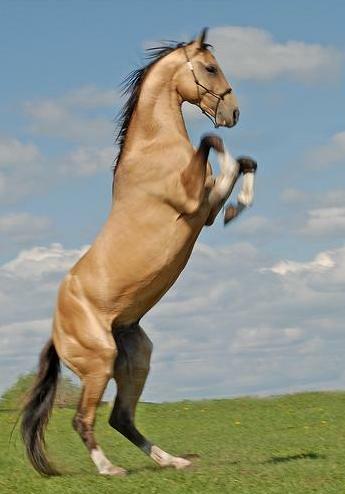 They hold their proud hook-nosed head up and their golden manes are streaming gloriously in the air”. Herodotus reported that the Turanians (ancestors of the Turkmen) chose the horse as a symbol of the sun, because, in their opinion, the fastest luminary in the sky (alternation of day and night) was to correspond the most fleet-footed animal on earth. Probably that is why "Pegasuses - winged horses" that are seen on ceramic vessels and coins of the rulers, are so popular in Parthian art. The image of "Pegasus" present in the Turkmen dastans and epics. For example, in the dastan "Govher giz and Shirali beg " when his horse fell, a stranger appears and helps the hero: "From the rising of the sun the horse with the reins, casted over his saddle, fast like a greyhound, appeared. The whole harness on the horse was glittering in the sun so one was blind with it. The man took the horse by the bridle, led him to Shirali and said, "Son, once your horse has fallen on the road, I give you this horse. Even if you ride on it the whole world, and even then it get tired. Its name is Gushganat – having wings like a bird. " The hero Gerogli tells about his horse Gyrate in the epic, "I want to tell you, my father, Gyrat jumped over the Amu Darya river. It seems that God supported it - Gyrat flew over as it had wings. " In various versions of the epic "Gerogli" Gyrat and his brother Durat were grown in a stable without light. In one version, by an oversight of Gerogli, a ray of sunlight fell on the horses, and their wings stopped to grow. Later, Turkmen legends related the origin of the akhaltekins with “winged sea” argamaks, caught and handled by the prophet Suleiman. Till this time, according to popular conception, Duldulbaba (Duldulata) has been considering the protector of horses, he had “Pegasus” Duldul – the progenitor of the Turkmen horses. Duldul, as ancient legends tell, often helped his owner out of trouble. He flew over the mountains and rivers to help his owner. There are many legends about the "winged horses" of the Turkmen – they are examples of the rich mythology of the Turkmen - descendants of the first breeders in the world. The ancestors of the Turkmen settled extensively in the countries of Asia, Europe and North Africa. And everywhere, where they arrived, the local people acquainted with the beautiful akhaltekin. Turkmen horses are immortalized forever in the ancient bas-reliefs and sculptures of Assyria and Urartu, Egypt, Rome, Hellas, China, Mongolia, Altai, Iran and India. The whole centuries-old history of the Akhaltekins is permeated with evidences of their unique fighting skills. Much was included in the complex training of the horses: when a rider fell, he stopped near the owner and did allow anybody to approach to him, laid down near the wounded man in order he could easier to climb into the saddle, and then he took out his owner from the battlefield, etc. European and Asian writers since ancient times had been writing about the incredible efficiency of Turkmen horses. They still have not lost their stamina. For example, in the ХХ century two unparalleled horse races Ashgabat - Moscow were made. In 1935, the Turkmen horsemen passed 4300 km. for 81 days, and in 1988 - 3200 km. for 62 days And here we should note, that the desert horses raced on the pavement, loose and boggy soil, they were nervous because of the tight ring of cars, etc., but the Akhaltekins passed the examination. No wonder the "horse of the ХХ century" was called Akhaltekin Absent, on which Filatov S. at the Olympic Games in Rome in 1960 became the champion, in 1964 in Tokyo he won a bronze medal, and in 1968 – at the Olympic Games in Mexico City he became a prize winner. But we should remember that the horse for the Turkmen was not only a fighting machine, but also a friend, brother, for whom our ancestors gave their lives. But in the second half of the twentieth century, the akhaltekin horse was on the verge of extinction: there were no races any more, the maintenance and publication of the State herd-book was stopped, and the research work was not conducted. Since gaining independence Turkmenistan National Association "Turkmen Atlari" was created. 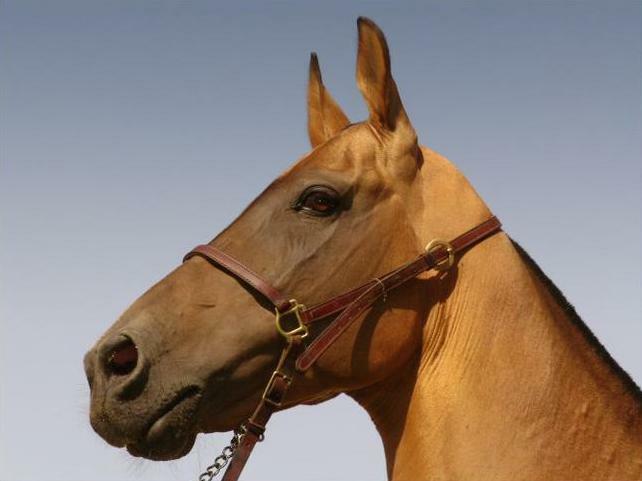 Since 1992, on last Sunday of April the Day of Turkmen Horse has been celebrated annually in Turkmenistan. The horses are declared the national heritage of the Turkmen people. Approximately 140 Turkmen of elite classes (representation class) and choice varieties today are in the President stable - model farm, where practically all lines of akhaltekin breeding are presented. Among them there are winners of numerous races and exhibitions - black Bitaraplik, Piyada - golden - light-bay handsome fellow, who won in 1994 in speed competition, gray-black Kervenbashi; Erekdag - creamy stallion, established as a champion of breed in 1994, golden - light-bay Tebigat - the champion of the breed in 1995, and others. But, of course, a light-bay Yanardag, a contemporary of independence, who was considered as World Champion of breed on World exhibition of akhalrekin horses in Moscow, is original gem among other horses. Namely, Yanardag is represented in the center of the State Emblem of independent neutral Turkmenistan. Akhaltekin horse complex was put into operation inTurkmenistan. It is the largest in Central Asia supermodern complex, which spreads at the foot of Kopetdag (56 hectares). Here are hippodrome with three races (distance 2000, 1800, 1600 m.) and the spectator stands for 5000 seats, the arena for the exhibition, special walking area and utility rooms. The separate building is for the jockey club, where classrooms and a gym are. The huge swimming pool is constructed for the akhaltekins and six stables for 300 horses with a special ventilation system and protection from insects are unmatched. The only one the immunological laboratory of Central Asia is also here, and you can have a DNA analysis that confirms thoroughbred horses. There is a special veterinary laboratory with operating and viewing rooms, X-ray equipment and ultrasound, as well as photo finish, accurately fixing the results of the race.